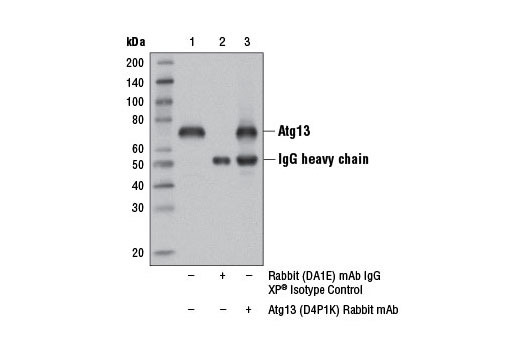 Atg13 (D4P1K) Rabbit mAb recognizes endogenous levels of total Atg13 protein. Monoclonal antibody is produced by immunizing animals with a synthetic peptide corresponding to residues surrounding Asp462 of human Atg13 protein. Autophagy is a catabolic process for the autophagosomic-lysosomal degradation of bulk cytoplasmic contents (1,2). Autophagy is generally activated by conditions of nutrient deprivation but has also been associated with a number of physiological processes including development, differentiation, neurodegeneration, infection, and cancer (3). The molecular machinery of autophagy was largely discovered in yeast and referred to as autophagy-related (Atg) genes. 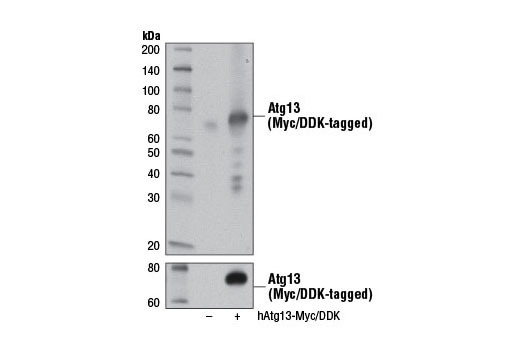 Atg13/Apg13 was originally identified in yeast as a constitutively expressed protein that was genetically linked to Atg1/Apg1, a protein kinase required for autophagy (4). 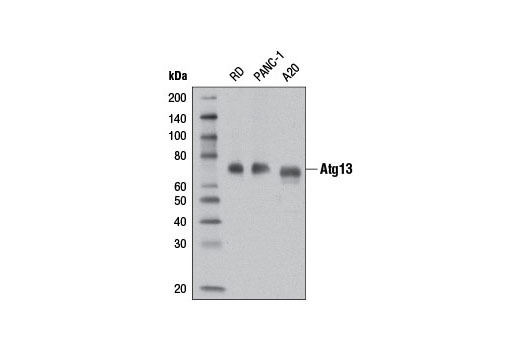 Overexpression of Atg1 suppresses the defects in autophagy observed in Atg13 mutants (4). Autophagy requires a direct association between Atg1 and Atg13, and is inhibited by TOR-dependent phosphorylation of Atg13 under high-nutrient conditions (5). Similarly, mammalian Atg13 forms a complex with the Atg1 homologues ULK1/2, along with FIP200, which localizes to autophagic isolation membranes and regulates autophagosome biogenesis (6-8). mTOR phosphorylates both Atg13 and ULK1, suppressing ULK1 kinase activity and autophagy (7-9). 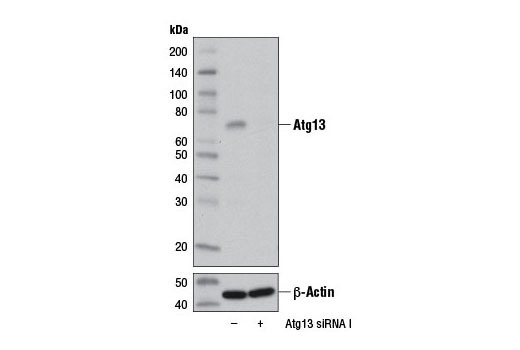 ULK1 can directly phosphorylate Atg13 at a yet unidentified site, presumably to promote autophagy (7,8). Additional studies suggest that Atg13 and FIP200 can function independently of ULK1 and ULK2 to induce autophagy through an unknown mechanism (10). Levine, B. and Yuan, J. (2005) J. Clin. Invest. 115, 2679-88. Funakoshi, T. et al. (1997) Gene 192, 207-13. Ganley, I.G. et al. (2009) J Biol Chem 284, 12297-305. Hosokawa, N. et al. (2009) Mol Biol Cell 20, 1981-91. Alers, S. et al. (2011) Autophagy 7, 1423-33.